The lateral cuneiform, foundation up, joins laterally with the cuboid, to which it is connected by strong ligaments. Joining with the base of the second metatarsal, it protuberates more distally compared to the intermediate cuneiform. The pan of inception of flexor halucis brevis is created by proximal pan of the undersurface. Strong attachment to plantar interosseous ligaments is given by the broad lower parts of these sides that connect the bones strongly with each other in the transverse arch of the foot. The synovial joints in between the three cuneiforms and also in between the lateral cuneiform as well as cuboid all lie at the upper limits of the surrounding sides. Each cuneiform joins with the foundation of its own metatarsal bone. The first kinds a different synovial cavity. The other four metatarsal foundations share a common joint area, linking with intermediate and also lateral cuneiforms as well as the cuboid, and with one another. This area elongates back together with the intermediate cuneiform into the joint in between the cuneiforms and the navicular. It is also wedge-shaped like the intermediconsumed cuneiform, however larger and also has no P-shaped aspect. Dorsal side or foundation: The dorsal side is rectangle-shaped fit. It is unequal and broad. Plantar side: The plantar side is a narrow strip that gets a tendinous slip from the tibialis posterior and often the flexor hallucis brevis muscles. Distal side: There is a rounded notch throughout the lateral border so that in reality the surface is more commas formed. The distal side is basically triangular, with its base along the dorsal margin and its pinnacle pointing in a plantar direction. It is entirely covered by a triangular aspect for joining with 3rd metatarsal. Proximal side: Its lower part is unequal and upper part has an aspect for joining with the navicular. The plantar element of the proximal side is honed and unequal for ligamentous connection, while the dorsal element has an oval articular aspect halfway for the navicular and also a rim laterally, which separates it from the lateral side of the bone. Medial side: The rest of this side is roughed up for interosseous ligamentous connection other than for a small articular notch in the dorsodistal corner for the second metatarsal. This proximal side is constant with that on the medial side for articulation with the intermediconsumed cuneiform, which creates an approximately triangular side on the proximal as well as dorsal margins. 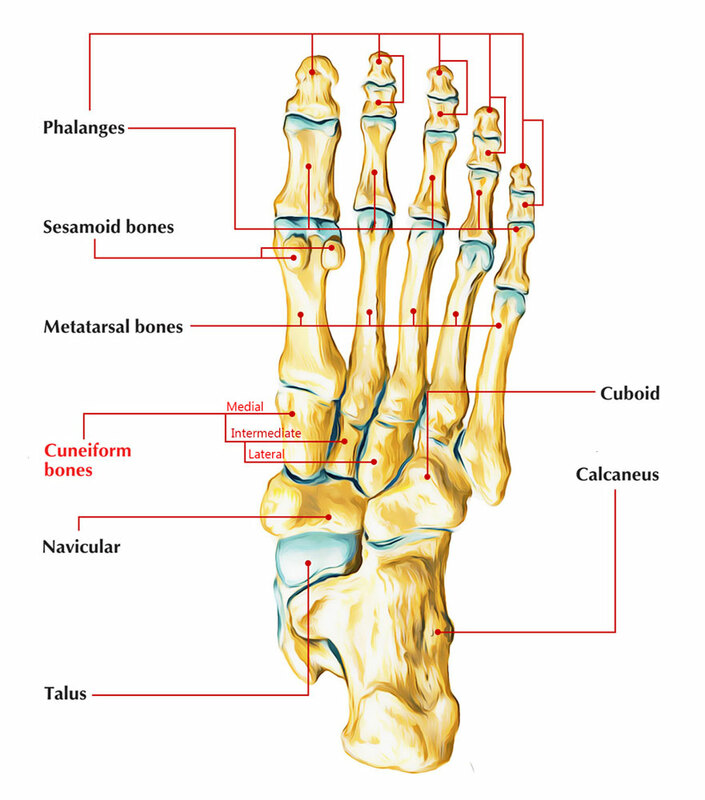 It has an aspect proximally to articulate with the intermediate cuneitype and distally two small aspects articulating with the Second metatarsal. Lateral side: The lateral side has a large oval concave aspect in the proximal dorsal corner for articulation with the cuboid and a small concave aspect in the dorsodistal corner for articulat ion with the foundation of the fourth metatarsal. The rest of this side is roughed up for ligamentous connection. Flexor hallucis brevis: The proximal part of the lateral cuneiform undersurface triggers this muscle. Tibialis posterior: Among its fibrous terminal tendon slips connects to the narrow plantar side. Plantar interosseous ligaments: Emerge from the lower part of the lateral cuneiform, creating part of the transverse arch of the foot, these are primarily cuneocuboid ligament and intercuneiform ligaments which assist moving and rotation in pedal pronation or supination as well as when the forefoot is stressed out, as in preliminary thrust of running and leaping. From center appearing at the 1st year. History and physical examination findings (inflammation with weight bearing and on palpation) plus radiographs make the medical diagnosis. Radiographs of the foot ought to consist of AP, lateral and oblique views – preferably these will be weight bearing movies. If the medical diagnosis stays uncertain, a CT scan with coronal restorations can be acquired. Displaced fractures need an open decrease and internal fixation with screws. When bone loss exists, bone graft might be had to fill the problem. Non-displaced fractures with a steady tarsometarsal joint can be dealt with closed with a short leg walking cast for 6 weeks. If follow-up x-rays continue to reveal no displacement, then the cast might be altered to detachable boot.